If you work in a corporate environment you will know how important your image is. We are not only assessed on our abilities and our work output but are also assessed on our image - how we look and conduct ourselves. Suits wear out and you need to replace them. I have addressed the second problem on this blog before. I outlined a way to get fully tailored, high quality suits made in Asia which looks better than anything that you can get in western countries for a similar price. However, even if you do get your suits from Asia you are still paying hundreds of dollars per suit...and suits wear out. This post will cover some ways you can make your suits last longer. By following the steps below you will need to replace your suits less often, look better for longer and ultimate save a lot of money. Suits do wear out and there is nothing worse than seeing someone wear a suit that is well past its use by date. Although this approach may be 'snobbish', if you are working in any sort of corporate environment you are going to be judged on your looks (in addition to your ability) so you need to know when your suits are looking a little worse for wear. The biggest sign that your suit is starting to reach the end of it's life is that it is starting to get a shine to it. The shine is caused by the fabric flattening out and starting to reflect light. Have you thought about buying your own home? Have you done all your maths and worked out that actually...yes you can afford a home and it is the right time for to buy your first house? Many people get to this situation and then realise that they are missing one big hurdle...they don't have the deposit they need for a house. This post will give you some practical tips about how to save your deposit and my views on how much you should save for your deposit. I am currently saving for my first place of residence. If you follow this blog you will know that I already have an investment property however I have 'ring fenced' my investments (not legally but rather as a personal rule) so I am effectively saving for my first investment property all over again. Psychologically debt is a funny thing. Most of us need it from time to time and debt is not always a bad thing. In fact even consumer debt can sometimes be acceptable. Your home loan is a form of consumer debt that most of us need to take out at some point in our life and this is fine. Debt also needs to be paid back over time however many people do not pay back their debt in a logical manner. There is an order that you should pay off your loans however many people do not pay off their loans in this way but rather spread their repayments equally over all their debt. What is the logical order to repay debt? You should not pay the principal on any of the cheaper debt until the most expensive debt is completely paid off. Of course you should continue to make the interest repayments and allocate the principal component of this debt to the higher cost debt. Want an example? Ok assume you have the following debts...what order should you pay them off? A $300,000 home loan at 5% p.a. B $10,000 credit card loan at 22% p.a. D $200,000 tax deductible investment property loan at 6% p.a. Paying the loans in this order decreases the amount of time that it will take you to pay down your loan balances and reduce the total amount of interest you pay over time. By targeting the highest cost of debt first you are being the smartest and most efficient with your repayments. What are some of the reasons that people don't pay their debts in a logical order? Most of us feel better when we have less debts to deal with. What this leads to is people striving to pay off their smallest debts first even those these debts may not be costing us a great deal. I know a number of people who have paid off their extremely cheap student debt before they pay off their home loans which are costing them far more. If you can ignore the 'feel good' feelings that comes with paying off whole balances and concentrate on paying off your debt in a logical manner you will be much better off financially. The painful thing about making minimum repayments (which may actually increase the loan on some types of debt) or by paying interest only, is that your debt balance goes nowhere. You are paying money towards these loans but your balances aren't going down at all. People generally prefer to see their loan balances going down from paycheck to paycheck and it can be rather disconcerting to see most of the balances staying the same even though you are making payments. In this case what you need to concentrate on is the fact that you are actually paying down your highest cost of debt loan faster as a result of concentrating your payments. You are paying less total interest tomorrow because you are getting rid of your highest cost of debt today. Most forms of debt come with a pre-arranged payment plan and it takes effort to change it and most people can't be bothered going to their bank and changing this. For example most people would have their home loans and investment loans set up so that their are paying both principal and interest. If you wanted to pay down your credit card debt faster you would convert these loans to interest only loans and pay the extra amount off your credit card debt. After your credit card debt was paid off you would convert your home loan debt back to principal and interest. Doing this takes effort and there is one big trap - you end up with a whole lot more free cash which you can blow. If you are sensible and committed you should use all of this extra cash to pay down your debts and after the highest cost debt is paid off use all that cash to pay off your next highest cost of debt. Paying down your debt does have a logical order. If you follow it you can really improve your financial situation and get your debts under control faster. How do you pay down your debts? Do you have a pre-defined order? Have you ever done anything illogical to 'feel better'? Want to earn a 20%+ return? Pay down that credit card! Should I repay my HELP debt early? Where have all the Investment Banking posts gone? It is with great sadness (and some excitement) that I am announcing the removal of my Investment Banking posts from this blog. Over the last 3 years I have written 50 posts on Investment Banking and these have been some of the most read posts on the blog and have driven a significant amount of traffic to the blog. Why did I remove the Investment Banking posts? As I mentioned in my post reflecting on the 3rd anniversary of this blog, this blog had gotten incredibly large and unfocused. It was part personal finance, part career advice, part politics and a bit of economics thrown in there for good measure. In an attempt to streamline and refocus the blog I have removed the Investment Banking posts (although the other non core posts will remain on this site). Where can I find the posts on Investment Banking? As promised for several months I have compiled an annual net worth review which will attempt to not only give you an insight into how I have performed over the last twelve months but also a better look at how I structure my portfolio and my reasons for doing so. I have never provided this level of detail before in a post so I hope you find it interesting. 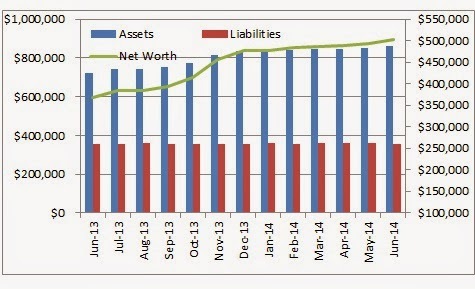 Over the last 12 months my net worth increased from $368,000 in June 2013 to $503,000 in June 2014 however as you can see from the chart below this was almost all an increase in my assets with my liabilities staying flat reasonably flat. If you look at my portfolio construction below you will see why my liabilities barely move month to month. A few months ago I combined my net worth and expenditure tracker posts as the posts were interlinked and it seemed to make sense to display them together. 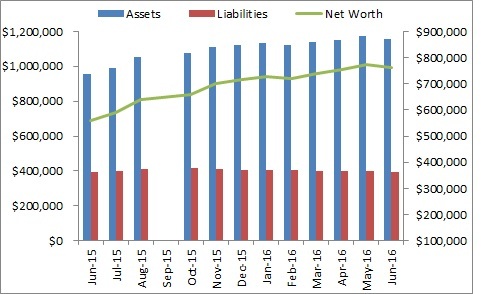 This post represents the 'regular' net worth update however in coming days I will also post up an annual review of my net worth performance which will give far greater insight into the construction of my portfolio as well as my liabilities. I was incredibly happy to reach my net worth goal for this month as it was also my revised goal for the year. I can't believe I've crossed the half million mark - although it has been a slow and steady process it still feels strange to sit here at this level.